If Putin decides to send in his troops, he has a narrow window in which to act. The winter of 2014 in Russia and Ukraine was relatively mild with little snow, while the spring is early and warm. The soil is drying rapidly, meaning that it will soon be possible to move heavy vehicles off of highways and into fields in southern areas of Ukraine close to the Black and Azov Seas. A key date is April 1, which marks the beginning of the Russia’s spring conscript call-up, when some 130,000 troops drafted a year earlier will have to be mustered out as replacements arrive. This would leave the Russian airborne troops, marines, and army brigades with many conscripts that have served half a year or not at all, drastically reducing battle readiness. The better-trained one-year conscripts can be kept in the ranks for a couple of months but no longer. Otherwise they’ll start demanding to be sent home, and morale will slip. As a result, Russia’s conventional military will regain reasonable battle-readiness only around August or September 2014, giving the Ukrainians ample time to get their act together. Ukraine has scheduled a national presidential election for May 25 that may further legitimize the regime the Kremlin hates and wants to overthrow. The Kremlin may find it hard to resist the temptation to attack Ukraine and “liberate” the south and east while Russia is ready, the Ukrainian military weak, and the regime in Kiev unstable. Such a move could lead to more Western sanctions, but this risk maybe dwarfed by the vision of a major geostrategic victory seemingly at hand. The window of opportunity for an invasion will open during the first weeks of April and close somewhere around the middle of May. During his long rule Vladimir Putin has generally shown himself to be a shrewd and cautious operator, but his actions during the Ukrainian crisis have been rash. So far his daring has paid off. This, unfortunately, is precisely what could trigger more bold moves down the road. In their search to maintain control, Russians would quickly discover that they are in possession of economically unviable provinces that cannot survive without massive infusions of rubles. According to a detailed Ukrainian study of how much Ukraine’s provinces paid into and received from the central budget in the first half of 2013, Crimea, Donetsk, Kherson, Luhansk, Mykolaiv, and Zaporizhzhya represented an enormous drain on Kyiv’s resources: 22.82 billion hryvnia (around $2.5 billion, or 90 billion rubles). And that is only for the first six months of the year. Multiplied by two, the deficit amounts to 45.64 billion hryvnia (about $5 billion, or 180 billion rubles). In 2014, Russia expects its budget revenues to be around 13.6 trillion rubles (around $375 billion); its expenditures are supposed to total 14 trillion rubles ($380 billion). That amounts to a deficit of 400 billion rubles ($11 billion). Even without extra development funds or the costs of an occupation, annexing Ukraine’s southeast will raise Russia’s deficit by 45 percent. The bad news gets worse for Russia. Luhansk and Donetsk provinces are home to Ukraine’s loss-making coal industry. Kyiv spends between 12 and 14 billion hryvnia(around $1 billion–$1.5 billion, or 47 billion–55 billion rubles) annually to support these mines. Will Russia back these enterprises even as they compete with more economically produced coal from Russia’s Kuzbass? It will have to: As Kyiv knows from experience, firing thousands of coal miners could spark massive civil unrest. Moscow will also have to pay them their wages on time. In 2013, wage arrears reached a total of 135 million hryvnia (about $15 million, or 530 million rubles) in Donetsk and Luhansk. As the Ukrainian presidential website reported Thursday evening, Ukrainian Navy commander Serhiy Haiduk along with several hostages was released from detention by Russian forces in Kherson region. Russian Defense Minister Sergei Shoigu had ordered the regional authorities to free the detained hostages and allow them safe passage out of the region. The hostages were revealed to be AutoMaidan activists, and 2 are currently hospitalized. Hostages were kept in the basement of the Republic military office in Simferopol since March 9th; the same which was seized by 100 Russian troops the day prior. According to UNIAN, the hostages said they were not fed for four days, and that the first day was especially trying as they were not allowed to drink, or the use of lavatory, and were also beaten constantly. They could not see their abusers faces as their heads were covered with bags and taped. One activist, who was placed in solitary confinement, said that there was no place to sit down, and because the room was so damp, he attempted to sleep standing up. The lone exception of the group, 64-year old Anatoly Kovalsky, said that while he was not physically beaten, he was abused mentally. In his case, he alleged that his captors constantly humiliated him and interrogators were regularly rotated every 10 minutes. According to Kovalsky, the interrogators wanted to know why the activists were in Crimea, their source of funding, if they were attempting to disrupt the referendum, and whether they had connections to Crimean Tatars or the Right Sector organization. The two who were hospitalized, Andriy Shevchenko and Yuri Schekun, were treated for bullet wounds from a traumatic gun. Reports claim they were shot in the hands, fingers, and feet. The Center for Investigative Journalism identified the captors as members of Aksyonov’s guard. Cinematographers from Babylon’13 remain missing since March 16th. AutoMaidan activists have in particular come under persecution from authorities over past months, with leader Dmytro Bulatov making international headlines after he was kidnapped, tortured, mutilated and crucified by who he described as Russians. The following map is an open source project designed to help spread accurate, timely information about the Russian occupation of Crimea. Data is drawn from various open and private sources. Some precise locations are unknown, and the status of many sites remain uncertain and in flux. Updates are made frequently. This map is created and maintained by “Paul Szegedin” (a pseudonym) and is also found at occupiedcrimea.blogspot.com. He can be reached at atszegedin74@gmail.com should readers be able to provide information or offer additional aid to the project. Ukrainian sites are marked in Blue, Russian sites in Red. Abandoned military sites are in Green. Things are beginning to unravel in Crimea. Russian occupation of key Ukraine military sites is moving forward in a haphazard, disorganized manner, by a combination of masked Russian Federation troops and mobs of local, Moscow-loyal irregulars. As of 19 March, the Ukraine Navy Headquarters in Sevastapol was captured and the anti-submarine corvette Ternopil was under blockade. Russians are throwing grenades at the ship to create an atmosphere of intense psychological pressure under a deadline to surrender the ship. Late 19 March the Ukraine National Security Council announced that troops would be withdrawn to mainland Ukraine. It is important to note that Ukraine itself, three weeks after the overthrow of Yanukovych, barely has a central government. Many of the officers of the military and border control were loyal to the corrupt regime, and are steadily being bribed with cash offers up to $200,000 to defect to Russia. A disorganized, catastrophic retreat and loss of Ukrainian Naval and Air Force assets in Crimea looms. Billions of dollars worth of ships and aircraft are about to be captured. On March 18th the self-declared prime minister of Crimea, Sergei Aksyonov, declared that in the coming spring young Ukrainians, Russians, and Tatars of Crimea will be drafted into the Russian army. In Russia, conscription is mandatory for all male citizens age 18-27. Earlier in the day it was announced that Chechen rebel leader Doku Umarov had died. The prospect of muslim Crimean Tatars, who make up 15% of the Crimean population, being forced to go to war in Chechnya may become a highly flammable situation. Crimean Tatars maintain friendly relations with neighboring muslim republics in Russia including Chechnya. Tatars largely boycotted the internationally unrecognized referendum. Deploying conscripts, which also would by nature include a large Ukrainian contingent against the Ukrainian armed forces in a potential conflict would also pose conflict. Summary: Russian troops are storming a Ukrainian military base in Simferopol, and one Ukrainian soldier has been wounded and one killed in the attack. It quoted an officer at the military topography and navigation centre as saying that its commander has been captured and the rest of the troops have barricaded themselves in on the first floor of a building at the base. Ukrainian PM Yatsenyuk has called the incident a war crime. Sources indicate that all Ukrainian troops have surrendered. The Ministry of Defense has given the OK to Ukrainian troops to return fire. The killed was ensign S. Kakurin, who was shot in the heart, and wounded was Captain V. Fedun, who was shot in the neck, and another soldier was shot in the legs. “In the windows of the houses near the base are Russian snipers. According to our records, this time one person is injured,” said a Ukrainian official. Rear Admiral Serhiy Haiduk said in a statement that during the shootout, an officer received two bullet wounds to the leg, and the wounds were not life threatening. He also said that Russian troops were advancing on the Feodosia garrison. “At this time, the kidnapping of five officers has been recorded. 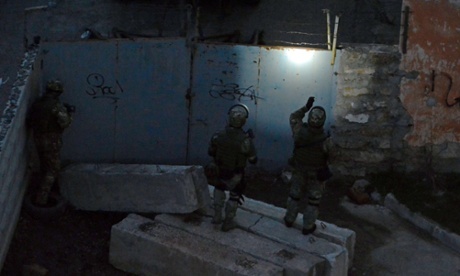 Two officers we were able to return, and three are held by the so-called “self-defense of the Crimea,” said Haiduk. Ed Flanagan of NBC also reported the incident of shots being fired in Simferopol in a series of tweets. He described 15 heavily armed soldiers running around front, carrying shotguns. He then said that local officials were keeping the press at bay. A public bus arrived with two vans, and troops entered into the vans along with plain clothes men. After the bus pulled back, armed men with 50 caliber sniper rifles and shotguns were seen taking positions around, and later entering the installation. Ben Brown of BBC reported that bursts of automatic fire were heard. Then, local resistance (Crimea SOS) citing the Ukrainian defense spokesman Vladislav Seleznev, said that one soldier was killed after the storming of the base in Novofedorovka. This report was confirmed by Reuters and Interfax. “One person was killed during the assault 13 FIZ. This Ukrainian soldier was on duty in the park area. Wounded were sent to the hospital emergency room in Simferopol” – he wrote on his page on the social network Facebook. “One Ukrainian servicemen was wounded in the neck and collarbone, now we are barricaded on the second floor of the production building. They are demanding to they lay down their weapons, but we will not give up,” – said the representative of the MOD. It was then uncovered that at least 1 had been killed in the attack. “Our sources said besides the wounded, one Ukrainian soldier is deceased during the assault in Simferopol. Confirmation of the death comes from three different sources,” said an official. At 17:54 local time, in a joint statement of acting president Turchynov and PM Yatsenyuk, the two declared that Crimea had escalated from a political to a military conflict. Ed Flanagan then reported that a Ukrainian military spokesman told him all men on base were arrested and their weapons taken, and the wounded captain taken to hospital for treatment. Russian MP Vladimir Garnachuk spun the events so as to blame Ukraine, saying ‘Maidan’ activists ‘bombarded’ the base, and were responsible for the shootings, and to ‘not believe the propaganda. Despite claims in Russian media that unknown gunmen attacked both sides, photo evidence from the scene shows Russian military clearly operating in the area, detaining Ukrainian soldiers. 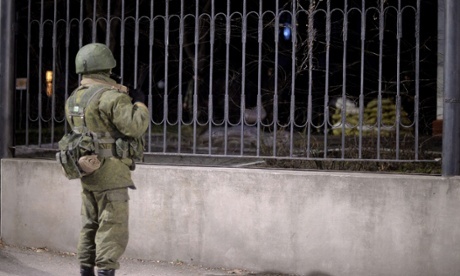 The Guardian has posted pictures of what are clearly Russian troops outside the military base. One shows a soldier standing guard outside the Ukrainian Navy headquarters in Simferopol, one shows Russian soldiers actively taking part in the military operation. The Ministry of Defence has allowed the military to use weapons in Crimea as a result of the assault.”According to the decision of the Acting Supreme Commander of the Armed Forces of Ukraine and the Acting Minister of Defence of Ukraine, on the basis of the order of General Staff Chief of the Armed Forces, Ukraine, Ukraine’s Armed Forces military units stationed Crimea, allowed the use of arms,” said the statement issued by ministry. The decision was made to protect soldiers in connection with the death of the ensign in Simferopol. The threat to close the Bosphorus to Russia comes from a report by Hvylya, citing a Turkish diplomatic source. According to the source, Turkish Prime Minister Tayyip Erdogan yesterday spoke with Russian President Vladimir Putin on the phone and warned of the consequences for conflict with Ukraine. The Hvylya source was also reported on by UNIAN. Concerns were also raised about the possible threat to ethnic Crimean Tatars in the region, citing recent murders and communications with Tatar leadership. Erdogan’s call to Putin warned that if Russia invades Ukraine, and so-called ‘Crimean self-defense’ forces engage in violence against the Tatar minority, Turkey will be forced to close passage into the Black Sea to Russian ships. Extranational protection of ethnic minorities was originally used as pretext for the Russian invasion of Crimea. In a separate announcement, Turkish Minister of Foreign Affairs, Ahmet Davutoglu, said Moscow was pursing “self-willed policy” in the region and urged Russia to respect the territorial integrity of its neighboring countries. “The security of Tatars is the main strategic priority for Turkey,” he remarked. “Pandora’s box should not be opened. If you create a de facto situation in Ukraine, this will have a domino effect on all the countries in the Eurasia region,” Davutoglu said in televised remarks made the day of the Russian implemented referendum. [Moscow analyst Aleksandr Morozov] begins by surveying what he describes as three basic interpretations of Crimea: the first, offered by many in Moscow and elsewhere is that what Putin has done is a form of “revenge” for Kosovo and that no one should think that Putin “is beginning any ‘new process’” at all. The second, he suggests, is that “the ‘Ukrainian strategy’ of the Kremlin is a conscious effort to begin a new war with the West.” In that view which has been articulated by Fyodor Lukyanov, “Crimea is only a casus belli” rather than revenge for Kosovo, and thus represents an effort to overturn 1991 and “begin a new era” in international relations. And the third, offered by Gleb Pavlovsky, holds the Putin’s involvement in the Ukrainian crisis is not really about foreign policy at all but rather is “only an occasion for changing his own system of power,” a revolution intended to allow him to exit from “’procedural democracy’” and to create “a situation of indeterminacy” in which he can act more freely. Morozov himself offers a more radical interpretation. According to him, Putin in Crimea has dramatically changed course. Until 2012, he writes, Putin plotted his course between “capitalization” and “sovereignty,” terms that followed “a completely traditional political logic” and one entirely understandable in the West. But he continues, “Crimea’ means that Putin has completely shifted to another politics altogether. Now, he is prepared to sacrifice capitalization, to suffer a sanctions regime and risk the blocking of accounts. And by seizing Crimea, he has broken with the old ideas about sovereignty as well. In short, Morozov says, “capitalization and sovereignty have been exchanged for the creation of a situation of an indeterminate future and the policy of revenge.” And revenge of this kind by its very nature “cannot be served by the forces of regular political discourse. It has another form of rationality” and “is based on a political myth.” That in turn means, he continues, that “the discourse of Realpolitik is giving way to risk, heroism, the hero-ization of suicide, and … [a handing oneself over to] ‘fate,’” a shift that “does not consider any other possibilities for the future, except success” and thus does not make the kind of calculations that most political leaders do. On the 15th of March, Moscow has witnessed – in addition to the anti-war and anti-imperialist march – a march in support of the Russian military occupation of the Autonomous Republic of Crimea. The latter was organised by the Essence of Time movement founded and headed by Russian National-Bolshevik Sergey Kurginyan. Russian socialism should be built by new people, a new type of people, a new class. A class of heroes and revolutionaries. The remains of the party nomenclature and their ramshackle order should fall victim to the socialist revolution. The Russian national revolution. The Russians are longing for freshness, for modernity, for unfeigned romanticism, for living participation in some great cause. Everything that they are offered today is either archaic (the national patriots) or boring and cynical (the liberals). The dance and the attack, fashion and aggression, excessiveness and discipline, will and gesture, fanaticism and irony will seethe in the national revolutionaries – young, malicious, merry, fearless, passionate and not knowing limits. They will build and destroy, rule and fulfill orders, conduct purges of the enemies of the nation and tenderly take care of Russian elderly and children. Wrathfully and merrily will they approach the citadel of the ramshackle and rotten System sic. Yes, they deeply thirst for Power. They know how to use it. They will breathe Life in society, they will shove the people into the sweet process of creating History. New people. Finally, intelligent and brave. Such as are needed. Who take the outer world as a strike (in the words of Golovin). Immediately before his death, the French fascist writer Robert Brasillach voiced a strange prophecy: “I see how in the East, in Russia, fascism is rising – a fascism borderless and red”. Note: Not a faded, brownish-pinkish national capitalism, but the blinding dawn of a new Russian Revolution, fascism – borderless as our lands, and red as our blood.